WALLY COX, American television and motion picture actor, born (d. 1973); Cox attended CCNY, had four months of Army service, and then attended New York University. He supported his invalid mother and sister by making and selling jewelry, in a small shop, and at parties — where he started doing comedy monologues for the guests, which were well-received enough to lead to regular performances at nightclubs such as the Village Vanguard, beginning in December 1948. Cox appeared in Broadway musical reviews, night clubs, and early TV comedy-variety programs in the period 1949–1951, creating a huge impact with a starring role as a well-meaning but ineffective policeman on Philco Television Playhouse in 1951. Producer Fred Coe approached Cox about a starring role in a proposed live TV sitcom, Mr. Peepers, which he accepted. Peepers ran on NBC for three years and made Cox a household name in the US. In his early New York days, he was the roommate of his boyhood friend, Marlon Brando, who encouraged him to study acting with Stella Adler. Cox and Brando remained very close friends for the rest of Cox’s life, and Brando is reported to have kept Cox’s ashes in his bedroom. 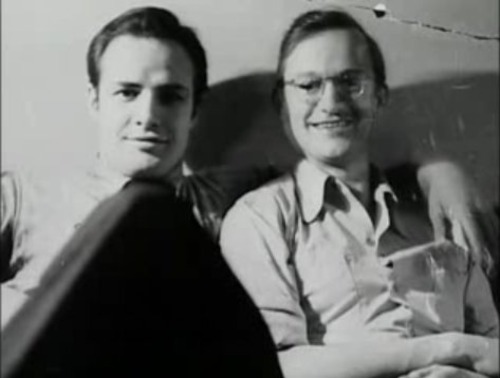 Brando was quoted as saying, “Like a large number of men, I, too, have had homosexual experiences, and I am not ashamed.” Wally Cox was an alleged long time lover of Brando’s. Brando is quoted as saying: “If Wally had been a woman, I would have married him and we would have lived happily ever after.” After Cox died, Brando kept his ashes for thirty years; they were eventually scattered with his own.